I love love love Italian flavours. Always have done. 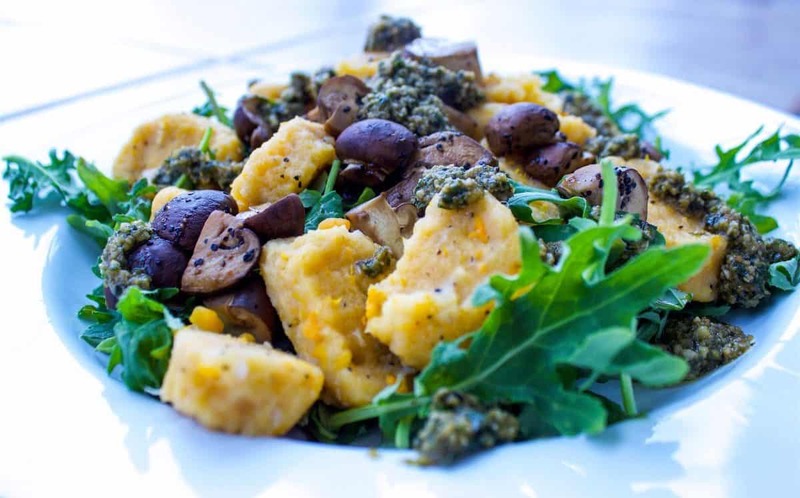 I had gnocchi for the first time a couple of years ago (I know, I can’t believe it either) and it was the most delicious food I’d ever had. In a light garlic basil oil with sundried tomatoes, it tasted like heaven. Then and there I decided that I would somehow recreate it for myself, although I had no idea how it was made or what I had to do to make it gluten-free. 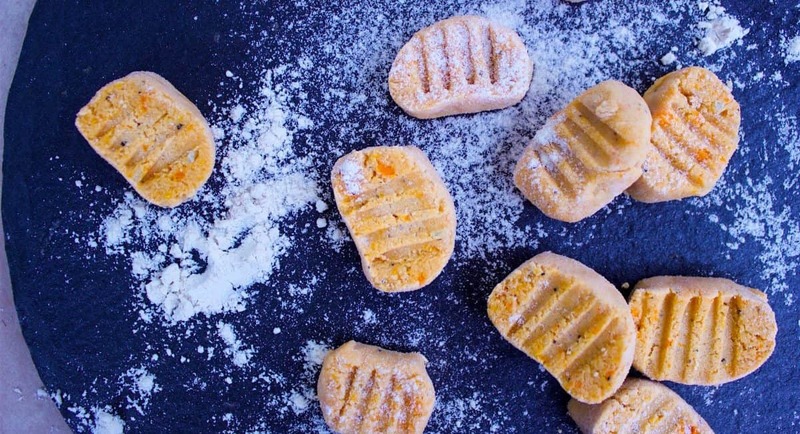 I’m really pleased with this recipe for yam gnocchi, not least because it is both gluten-free and vegan (hooray), but because it’s a delicious flavour pairing. I intended to serve the gnocchi with pesto alone and was making the balsamic mushrooms for another dish, then accidentally tried them in the same mouthful. I think you’ll agree the combination is perfect – the balsamic sweetness offsets the savoury pesto delicately and creates a beautifully rounded flavour. Prepare the gnocchi. Boil the potato and yam together in a saucepan of water for 15 minutes until soft. Drain and mash until smooth, adding the garlic, salt and pepper, then add the flour, kneading into a dough. (It’s tempting to add less flour as the mixture can look a little dry – don’t do it!) Roll the dough into two sausages about 3cm wide and cut each into 1.5cm slices. Gently press a fork into one surface of each piece, flattening them slightly as you do so. Set aside on a tray. For the pesto, pulse all ingredients except half the olive oil in a blender to form a loose mixture. Gently stir in the rest of the oil until almost combined. Set aside. Heat the mushrooms with the vinegar, salt and pepper in a pan until bubbling gently. Cook on low for 15-20 minutes until the mushrooms are soft and the vinegar no longer tastes acidic. Set aside. Add the gnocchi to a large pan of boiling water and cook for 3-5 minutes, until they float to the surface. Remove from the heat and drain. 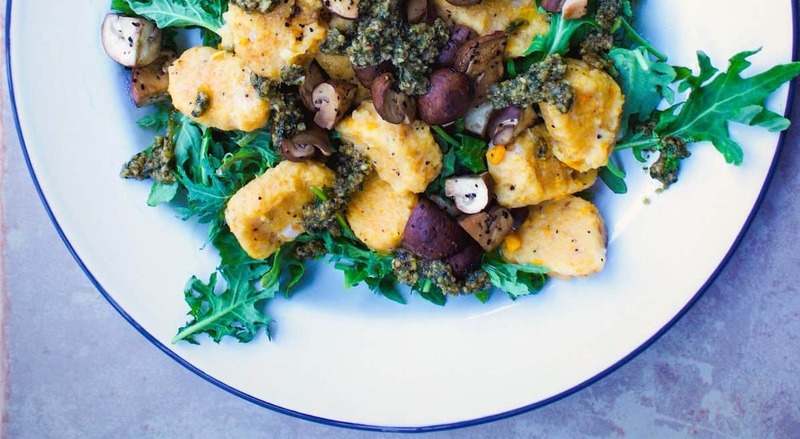 Serve the gnocchi over a bed of baby leaves. Add the balsamic mushrooms and drizzle pesto over the plate. Finally, sprinkle the toasted pine nuts on top and enjoy.